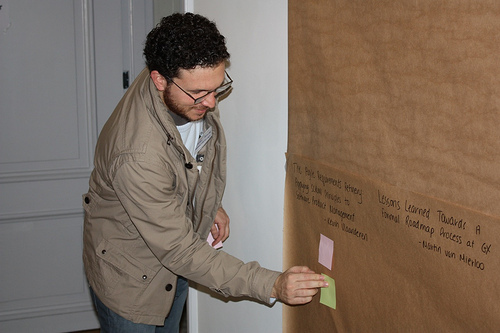 First Productcamp in Europe – How was it? 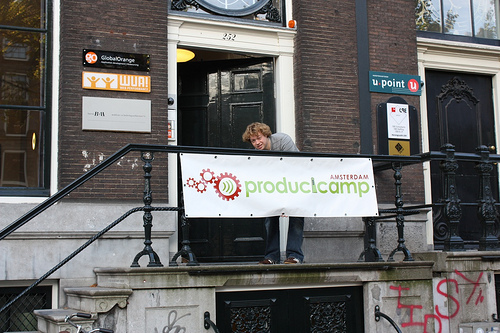 Last weekend I was in Amsterdam to attend the first product management barcamp held in Europe. I went a day earlier so I had the saturday to wander around the city a bit. So I strolled over a flew market, had a coffee and chocolate cake in the sun in front of the library and ate a burger at the „Burger Meester“ in the evening. On sunday morning started the actual event. 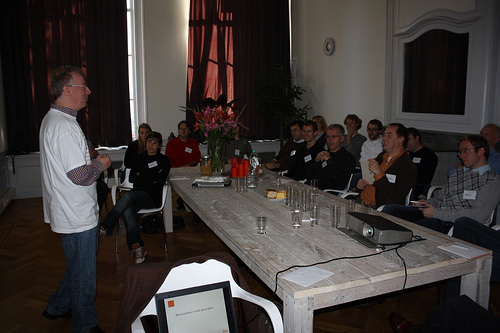 The location was WUA’s office in an old building at the Herengracht channel, really classy. 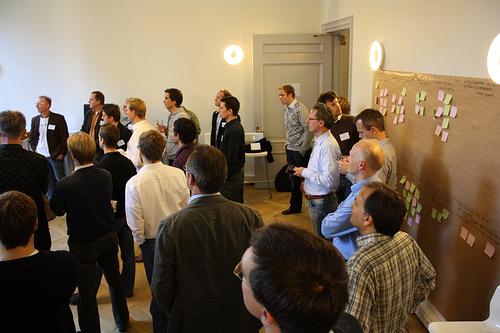 There were around 60 (mostly male) people attending the ProductCamp. 110 people had signed up so the no-show rate was pretty high, which is a pity and in my opinion an offense to the organizers. But 60 people was still fun. Ten sessions had been handed in beforehand and when I arrived I just got two post-its to vote for the two which interested me the most. This left most barcamp participants as „attendees“. For next time I would suggest neither to announce nor plan sessions beforehand. The session planning for the day should take place the same morning. All sessions on the website or wiki should just be suggestions to give a feeling on what people might be interested in. The sessions were split into two tracks, so five took place at the same time, that means everybody missed 8 of 10 sessions. Although it was just a one-day event I found that a bit a waste of time, more tracks would have been better I think. 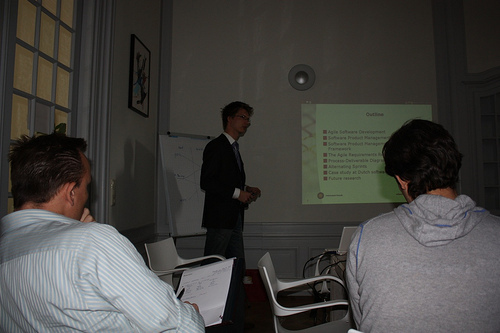 After a short introduction the first session track began. I attended „Best practices in lead generation“ by Richard McCarthy who promised us advice in how to win new customers. Unfortunately the only suggestion was to invest in dedicated landing pages instead of directing all traffic to the homepage – which surely was not new to many people in the room. McCarthy then demonstrated an analytics tool he invested in. It could filter visitors by company (by mapping the IP addresses) which could be helpful if these would be my potential customers. Altogether I must admit that I was a bit disappointed since I think product pitches are inappropriate for conferences, especially for barcamps (un-conferences). 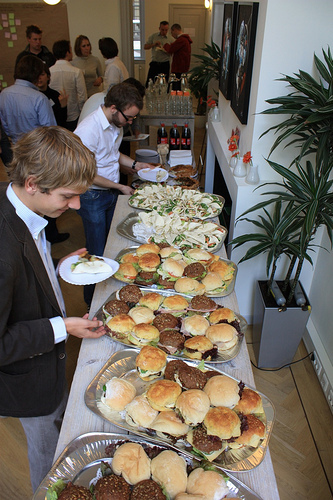 Then everybody had sandwiches for lunch (thanks Servoy!) and people mixed and had a chat. Since I don’t speak Dutch I was very thankful that every conversation I attended was done in English (or switched to English as soon as I hopped in). Also, Mark held a raffle and gave away some books from the sponsors. I think this is a great way to get attention from the audience. For the afternoon Session I chose Kevin Vlaanderen’s talk about „The Agile Requirements Refinery: Applying SCRUM Principles to Software Product Management“. Kevin took an academic approach to this topic. 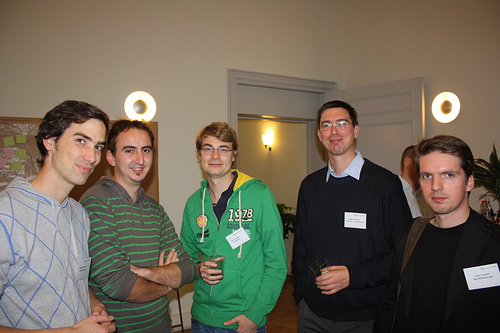 He studied the product management methodology at the company Planon B.V. as a side project of his Ph.D.
After the sessions were over and another raffle was held, everybody had drinks (thanks MeasureWorks!) and I stayed almost two more hours at the venue and enjoyed talking to everyone very much. Most people were from the Netherlands, but I also spoke with product managers from Belgium, Israel and, yes, Berlin! The next day I spent the morning an the library with free WiFi and a nice view over Amsterdam before heading to the airport and back home to Berlin. Altogether I really enjoyed Europe’s first Barcamp for product managers and thank Mark and the other organizers for the great day. Thanks again to the sponsors, the organizers and all participants. See you next year, maybe in Berlin? Until then, let’s keep in touch on Linkedin, Xing and Twitter. All photos were taken by Kiara Coen and published on the flickr productcamp profile under CC-BY-ND licence. Veröffentlicht am 21. Oktober 2009 Kategorien AllgemeinSchlagwörter barcamp, Konferenz, procamp, Produktmanagement3 Kommentare zu First Productcamp in Europe – How was it? Ich bin in Amsterdam und freue mich auf das morgige ProductCamp, ein Barcamp speziell zu meinem Lieblingsthema. 90 Personen haben sich angekündigt, bin mal gespannt.